So for a small island we did remarkably well in the quest for GOLD and enjoyed perhaps more success than was expected. In a time when many of our farmland birds have declined and continue to decline, the reasons for the decline touched on indirectly by the London Olympic Opening Ceremony with its theatrical depiction of first, the enclosure of much of the countryside followed by the industrial revolution, the GOLDfinch is a success story. The population of this brightly coloured finch has seen an increase of over 50% in recent years. These increases are believed to have largely come about through increased use of food resources in British gardens. The most recent survey results from earlier this year ranked GOLDfinches 7th in the list of birds attending garden feeders in our gardens. The bright red and black face of the GOLDfinch mark it out as one of our more colourful garden visitors and often larger flocks or ‘charms’ can be found feeding on field edge or hedgerow weeds. The bright golden wing bars and ‘tinkling’ flight calls make it one of the most easily recognised and often heard species in much of the British countryside. It readily mixes with other small finches and can often be found in mixed flocks with Linnets, Redpolls and Siskins. 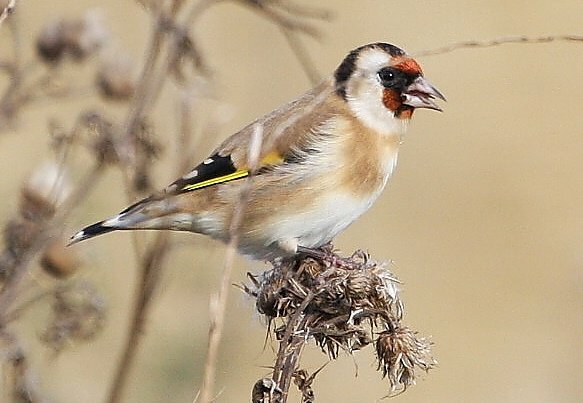 Whilst in the wider countryside it is most often found on ‘weeds’, Thistles or Teasel in the garden the increasing use of smaller seeds such as Nyger and also Sunflower Hearts appear to have created a valuable winter feeding resource that the GOLDfinch has been able to adapt to exploiting. British GOLD, let’s hope the success is here to stay!